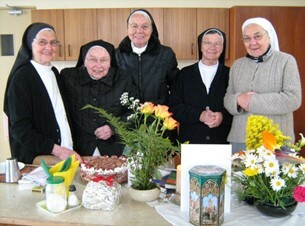 On August 21st 2013, Sr. Elreda celebrated her 80th birthday. Mother Prioress Maria Ignatius and Sr. Augusta from Windhoek drove to Swakopmund to help celebrate this day. Sr. Elreda was still in the process of recuperating from an operation, but was well enough to enjoy the day and go for a leisurely walk along the beach. When you are 80, you know that you don’t need many gifts anymore. Prayers are more important, but some sweets and your favorite food brighten the day. The Absolute crown of the day was an arrangement of flowers, almost 80 roses and some orchids sent from her sister, Irmgard from Switzerland. What a beautiful surprise! With Swakopmund’s climate, it will be beautiful for a long time. We, Sisters from Windhoek and some of our Namibian Sisters go there on holidays and, therefore highly appreciate the Sisters; we always find a welcoming community and the best place to stay there.